After all the usual and proper medical approaches did nothing for her pain, Cheryl Campbell, a nurse and mother, says she finally built up the courage to ask her doctor, "How do you feel about prescribing me marijuana?" The 30-year-old Ottawa woman suffers from fibromyalgia and chronic fatigue syndrome. Her pain is body-wide - a constant, sometimes stabbing ache in her back, hips, knees, shoulders and virtually every joint. Doctors once put her on morphine. It cut the pain, but she couldn't function. She says her mind felt so heavy with fog she couldn't carry on a conversation. She's been using marijuana for pain for two years; she has a federal licence to possess it. She says it helps her sleep at night. In the morning, it helps ease the stiffness in her hips and back enough that she can make it into the shower. Campbell says she owes her ability to get through each day to a drug that critics condemn, especially when it's smoked - which is how most of the thousands of Canadians who self-medicate with pot prefer to take it. The U.S. Drug Enforcement Agency was unequivocal earlier this year: Smoked marijuana is not medicine, and it's not safe. "No matter what medical condition has been studied," the agency ruled, "other drugs already approved by the [U.S. Food and Drug Administration] have been proven to be safer than smoked marijuana." But research into medicinal marijuana is undergoing a surge of interest, with more evidence emerging not only of its ability to ease human suffering, but also of its apparent safety. Some say cannabis may be less toxic to humans than over-the-counter pain relievers. Four small but scientifically controlled experiments in recent years have concluded that smoked cannabis can provide moderate relief from chronic, severe non-cancer pain - including HIV-related nerve pain and post-traumatic neuropathy, a dreaded condition that can follow an injury or medical procedure. Both are notoriously resistant to conventional treatments. Scientists are only beginning to tease out the possible anti-cancer properties of pot. Early experiments in animals suggest that purified forms of THC and cannabidiol - two major constituents of marijuana - can induce certain cancer cells, including breast cancer cells, to essentially kill themselves off - a process known as apoptosis. The cells self-destruct; they stop dividing and spreading. Cannabinoids also seem to shut down a tumour's life-giving blood supply. Meanwhile, researchers across Canada are testing cannabinoids against arthritis, glaucoma and gastrointestinal inflammatory diseases, such as Crohn's. "Science is just scratching the surface," says Dr. Mark Ware, head of the Canadian Consortium for the Investigation of Cannabinoids and director of clinical research at the Alan Edwards Pain Management Unit at Montreal's McGill University Health Centre. In Canada, synthetic versions of THC and other pure cannabinoids are already available by prescription - pills and sprays approved for cancer pain, for nausea associated with chemotherapy, to stimulate appetite and for the relief of the pain and spasticity of multiple sclerosis. Medical marijuana, Ware argues, is essentially just a different delivery system for cannabinoids. It's crude, he acknowledges. It's also associated with potential harms through the sheer act of burning the plant and smoking it. But even then, he says the evidence is uncertain. "It's not a done deal that smoking cannabis alone is as potent a cancer-causing agent as tobacco," Ware says. According to U.S. drug enforcement officials, while smoked marijuana can cause changes in lung tissue that may very well unleash cancer, "it's not possible to directly link pot use to lung cancer based on existing evidence." But does it have any legitimate role in medicine? Modern interest in cannabis exploded in the 1980s when researchers discovered all mammals - notably humans - have an endogenous, or built-in, can-nabinoid system. Essentially, we make our own marijuana. Two types of receptors for cannabinoids - CB1 and CB2 - are found in the brain and spinal cord, nerve cells and immune tissues. The body produces a natural, THC-like chemical called anandamide - the so-called "bliss chemical" - that binds to these receptors. Anandamide has been found to play a part in pain, anxiety and depression. The reason we don't walk around high all the time is that anandamide is released only in response to noxious or painful stimuli, such as an injury or inflammation. The neurotransmitter latches onto the receptors and, in the case of pain, helps settle down the firing of nerves in the pain pathway. But it's bro-ken down quickly, chewed up by enzymes so rapidly it never reaches a level sufficient enough to cause a high. Despite its widespread illegal use, there are few, "if any," reports of fatal overdoses from cannabis, said Les Iversen chair of the U.K. government's Advisory Council on the Misuse of Drugs and author of The Science of Marijuana. By contrast, thousands die each year from "catastrophic" bleeding in the gut caused by non-steroidal anti-inflammatory drugs, or NSAIDS, he said. The most common side-effects are sedation and foggy thinking. "You can also get high," says Dr. Mary Lynch, director of the pain management unit at Queen Elizabeth II Health Sciences Centre in Halifax. "But many of our patients adjust the dose so they can avoid the side-effects and aim for the therapeutic effects, similar to the way we use any drug." Dr. Meldon Kahan and others worry that smoked marijuana's promotion among users as a legitimate medicine, especially for pain, is driving a rise in illicit use at a time when Canadians are already among the highest per capita users of pot in the western world. "A lot of people - particularly young people - are harmed by the notion that cannabis is this harmless herb," says Kahan, a physician and associate professor in the department of family medicine at the University of Toronto. A five-part series and data-journalism project coordinated by the Ottawa Citizen, with The Vancouver Sun, Edmonton Journal and Postmedia News Service. Saturday: Arthritis sufferers turn increasingly to cannabis for relief. TODAY: The science behind medical marijuana finds benefits and risks. Tuesday: Foot creams, gel capsules and vaporizers: How we consume marijuana. Wednesday: Cities bristle at the proliferation of legal growing operations in residential neighbourhoods. Thursday: A Canadian soldier used cannabis to treat post-traumatic stress disorder. It worked. 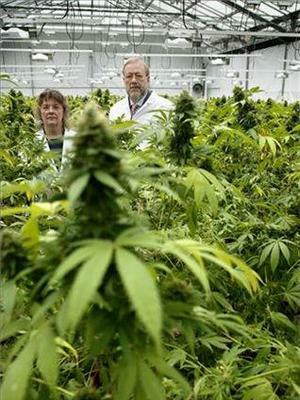 Go to vancouversun.com/medical marijuana for a searchable database of medical cannabis use by postal code and more stories in this series. The above originally appeared here. The Ottawa Citizen also has a news article about medical marijuana, this time profiling Tamara Cartwright, a Multiple Sclerosis sufferer.